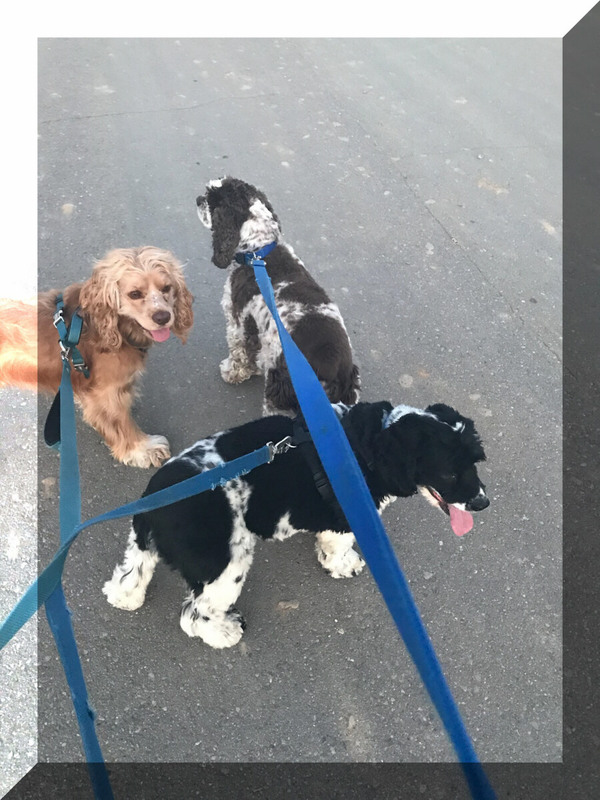 The pictures and stories on this page are from The Friends of Cherished Cockers who have opened up their hearts and their homes to a Cocker Spaniel in need. 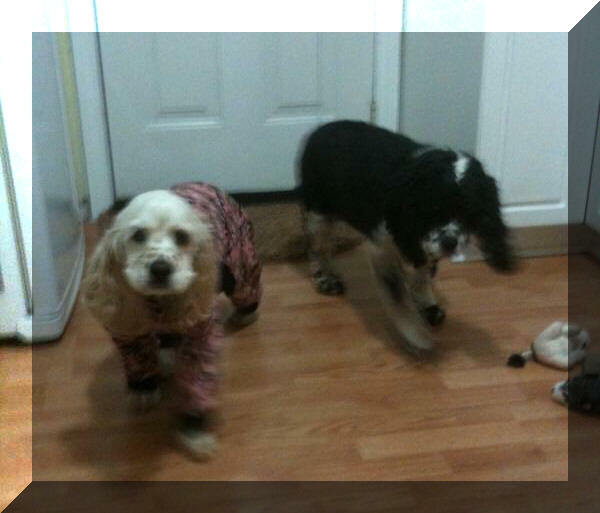 They are the adopters of our Cocker Spaniels and are providing a safe Forever Home for them filled with Love and Companionship. In return the cockers Velcro themselves to their owners and shower them with Cocker Kisses and lots of Love. Some people are unable to adopt for one reason or another but they are also a very big part of this page. Without the Friends of Cherished Cockers we would never be able to cover expenses for the needy cockers we help. Please consider a donation to Cherished Cockers Rescue to enable us to keep these success stories coming. He is such a sweet boy and is very loved by our family! He doesn't leave my mom's side all day long! From the moment Sammy arrived to my home we knew he would be a wonderful additon to our family! Sammy is a total sweetheart and we're so in love with him!!! 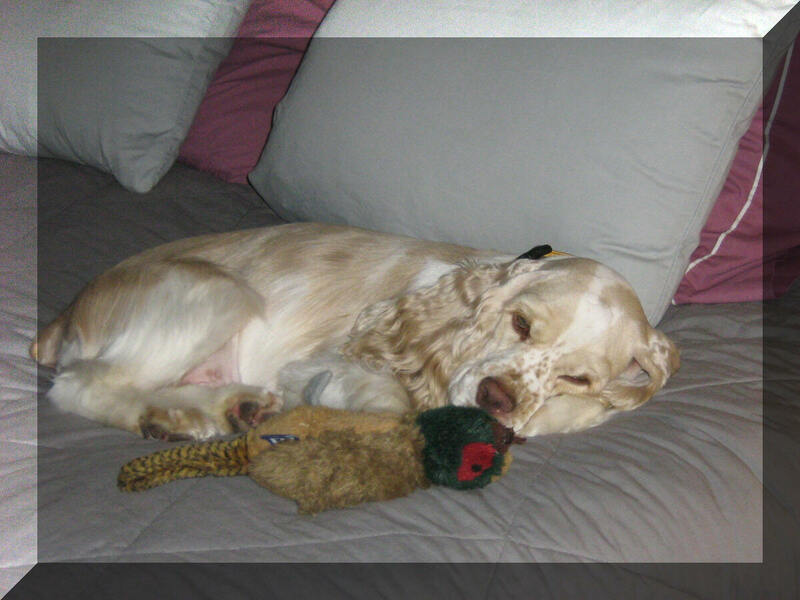 These days, Sammy enjoys playing with toys, running at the dog park, boating and of course snuggle time! Sammy has brought so much joy into our lives these past 4 months. He has a sweet & friendly disposition and is one of the most well behaved dogs I've ever known!!! Thank you for the work that you do and for bringing Sammy and Bo into our lives- my family and I will be furever grateful!!! This will be our first Christmas with our little cockapoo, Mia. We adopted her 3 months ago and it feels like she has been part of our family much longer. We had lost our lab mix, Chipper, last winter and we and our cockapoo, Libby were missing him greatly. We saw that Mia was available for adoption in August and upon meeting her at her foster home, we immediately fell in love with her. She is the most lovable, cuddly little girl and she brings us so much fun and joy every day. She loves chasing squirrels in the backyard and going for walks in the neighborhood and of course, many, many belly rubs. She is a great watchdog and is learning when enough barking is enough. That was the only issue that her foster mom thought we might have with her. She very rarely goes into panic mode whenever she sees someone or something outside any more. Hopefully, she knows that this is her forever home and she feels safe and secure. She and Libby are getting along well and are good companions whenever we have to go out. We can’t thank Cherished Cockers enough for rescuing Mia, which in turn, gave us the opportunity to adopt her. 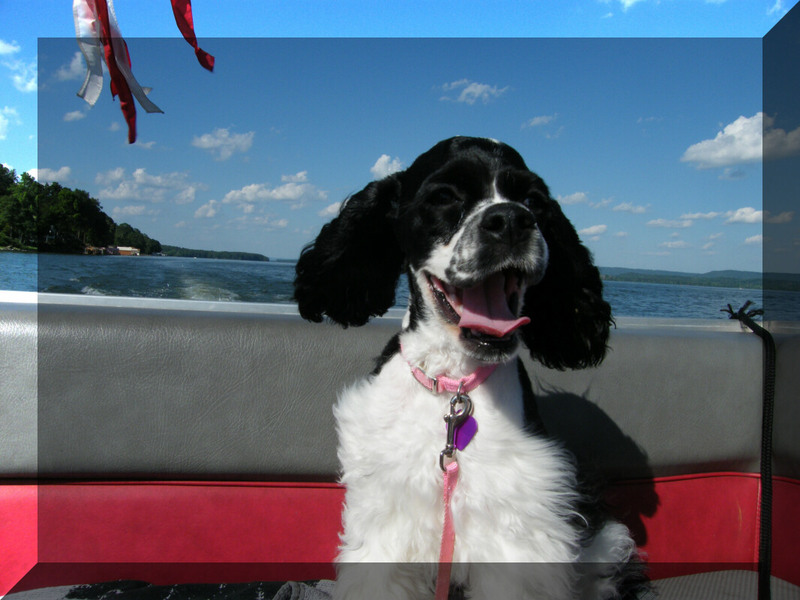 Also, many thanks to Donna and her family for fostering Mia this past summer. We wanted to share our story on our 1-year adoptiversary rather than shortly after the adoption since we felt we would have something more meaningful to share. Thank you for taking the time to read our little family tale. "CoCo" came home with us one year ago today (April 26th). She resembled a Kodiak bear so we renamed her Kodi. 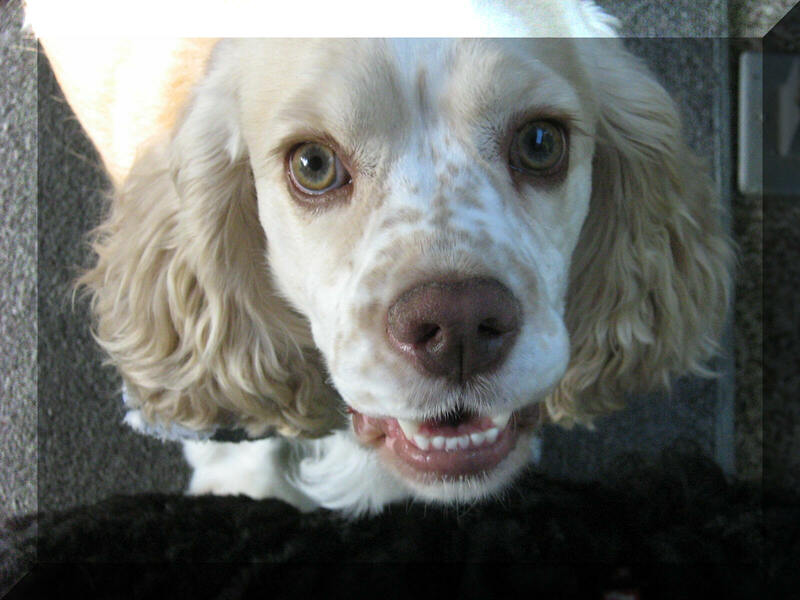 Although I already adored them, Evan had been given the false impression that Cocker Spaniels were high-strung or aggressive from his previous experiences with them but has come to know otherwise! Kodi is the ideal addition to anyone's life - the kind of dog you want to clone so she will be with you forever and you can share one of her with everyone you know. We had to drive almost 2 hours to meet her and were nervous to make a decision that would last a decade or more based on one 30-minute meeting but it was the best decision we've ever made. Although we were worried about her weight, her infectious happiness and sweet personality immediately made that seem inconsequential. For two normally happy people, Kodi brings even more light into our daily lives. She has such a kind soul and big smile, even when she sleeps; although she refuses to smile when there is a camera around. Every so often her innocent stubbornness shines through and her "I don't need any help" and "I do what I want" attitude is very entertaining and endearing. She has lost about half of the weight she needs to lose so that is still a work in progress. She loves to make us suddenly sprint with her when we go for walks, especially if it's windy and there are leaves to chase. It's hard to keep up with her sometimes! She is still learning how to play around with other dogs and toys but she is becoming more interested in playing. We are tremendously grateful for Christine rescuing her off of Craigslist so that we could find her and love her so much! Clyde's first week home has been nothing but smooth! Clyde loves laying with me on the couch, jumping on the bed while I'm trying to make it, licking ice cubes, and falling asleep with his stuffed monkey. He is still adjusting to Pittsburgh city life - all the noises, people, and attention! Nearly every one on the street stops to pet him, including Pittsburgh's Mayor Peduto! Clyde sometimes does his business in the middle of an intersection which gives everyone a good laugh. We're working on it! I don't know how I ever lived without Clyde. He has brought a spark and love into my life that is just...amazing! Thank you to the wonderful people of Cherished Cockers Rescue for giving me a fur-ever friend! Hello to you wonderful people at Cherish Cockers. I adopted Rudy from your organization on December 12,2014. If you can recall, Rudy had a few health issues. He apparently had a stroke and the one side of his face is slightly drawn and his right eye does not always blink with the left one. His skin has some areas that were healing from pustules, flea bites, and hot spot sores. He also has a little heart murmur and needs to rest frequently. I had inquired about a couple of other dogs, but when I saw his little face, I knew he was waiting to come home with me. I have also had health issues including strokes and heart attacks. Rudy and I both have recovered from our impairments and we make the best of everyday. He is wonderful. It is hard to go to work and leave him at home during the day, but I can go home at noon, eat lunch, and get a quick walk in. Rudy was originally from California and this past winter in Pennsylvania was a beast. He appeared amazed at the snow. His 6 inch legs were no match for the 28 inches of snow in the back yard, but we tackled that hurdle together. Rudy is a wonder roommate. He adapted very quickly and acted like he was glad to be in a forever home. He has wonderful manners and since only his left eye blinks well, he looks like he is constantly flirting with everyone. He is playful and knows when he is a little ham. He travels with me where ever I go. He enjoys going to the Dairy Queen, the car wash, the park, grandkids houses and has made several trips to Somerset Pa where his friends Dixie, Daisy and Ruby live. German Sheppard Ruby, is also originally from California. Everyone is amazed that he is 8 years old. He look like a puppy yet and so very friendly This was a such a wonderful experience. Rudy and I are a great match. He and I are still debating if I needed him more than he needed me, OR, he needed me more than I needed him. But we do agree that we are forever needing each other. Thank you for the work you do. hank you for being so thorough and making sure that these precious pups get a second chance of life that is full of love and care. God bless you, your coworkers, those who transport and those who foster. I’m not quite sure who rescued whom. Two puppies found on the streets of California, one with significant health issues, initially both meant to be with someone else. The call came and they were again available for adoption. We met and it was love at first sight...all of us. Fresh in the stages of a new (and painful) divorce, my son and I met Duke (a.k.a. Tyler) and Spencer -- the connection was deep, real, and so needed. We’ve created our new home in Chicago and can’t imagine life without our sweet pups. They are healing us. They provide love, enthusiasm, joy, and spirit --exactly what all four of us needed. It’s been two months since our adoption. Duke and Spencer are thriving.. as are my son and I. When the four of us are together, magic happens, dreams come true. We all feel love. We all feel valued. We all know that our existence matters. When it’s just the pups and I, I feel love, family, joy and know that their presence is helping me take care of me. The dogs help me be a better person. The universe works in mysterious ways. They rescued me as much as I have them. Love always wins. And we’re so grateful to have connected with our Duke and Spencer. We are a family and all is exactly as it should be. Thank you Cherish Cockers for making this all possible. We are forever grateful. Patches has made the adjustment and is very happy in our home. 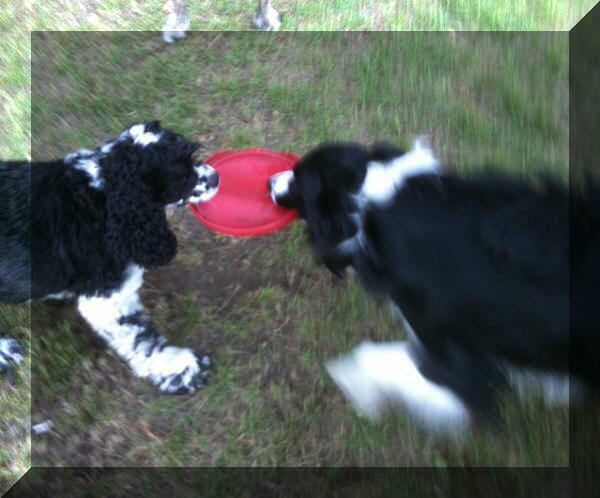 In only a few days, he and Murphy, our springer spaniel, were running and playing. I don't think Patches had seen a cat before, so Mia is still being chased. She always comes back for more so I think she almost enjoys it! We're just one big happy family! Nala is happy in her new home. 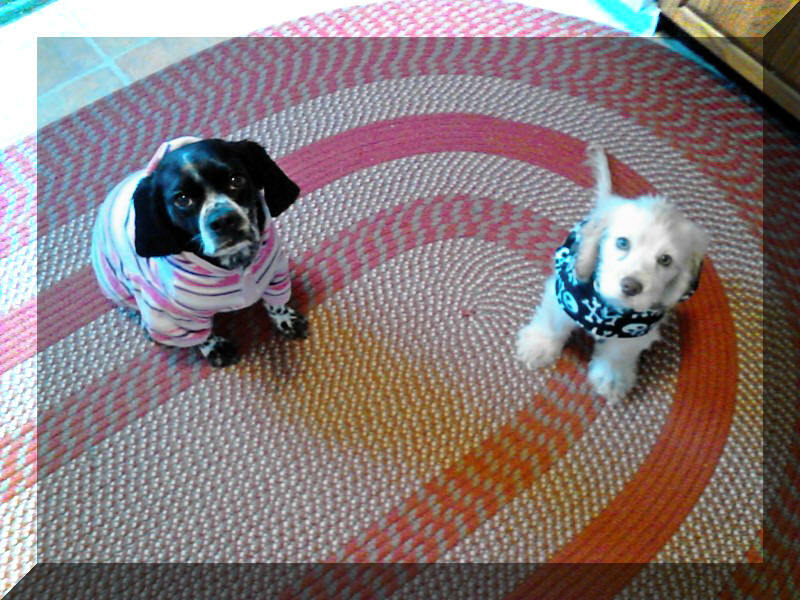 She is seen here with her new sister Keely. Although they didn't seem to get along at first, they now lay together. Nala is truly a sweetheart. She is so loving and is always ready for attention and a quick belly rub. She seems pretty well adjusted and met new people friends over the holiday. Everybody loved her. 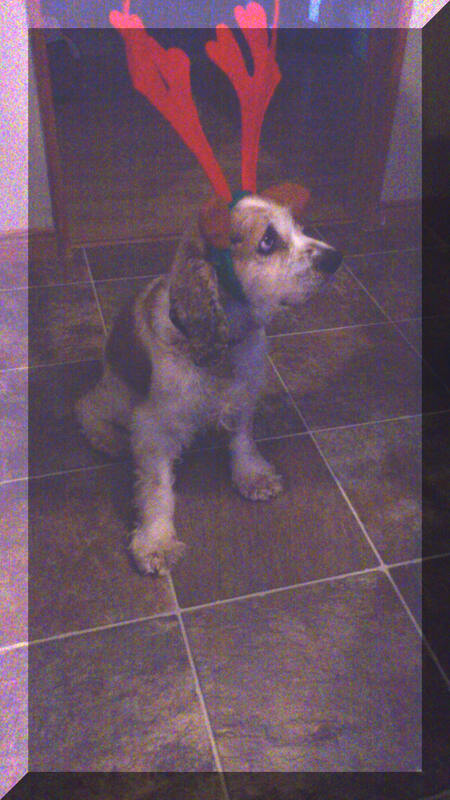 I wanted to let you know that Bogie was the best present we received this year. 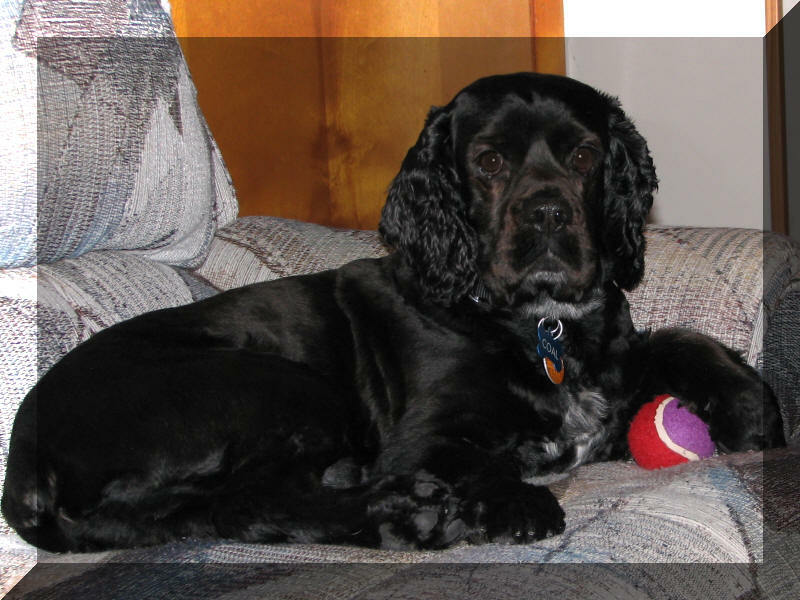 Bogie spends his day laying on the couch watching football, or taking walks with his brother Max and sister Bailey. He has found his forever home and he is very very happy (and spoiled). He is sweet and we love him so much. Thank you for all your hard work and dedication to helping dogs and families find each other. Please know that you have made a difference, and we are grateful to you and your organization. Hello, my name is Cooper and boy have I got an update for you on my Forever Home and Family of 5-1/2 years now. This year was really great. 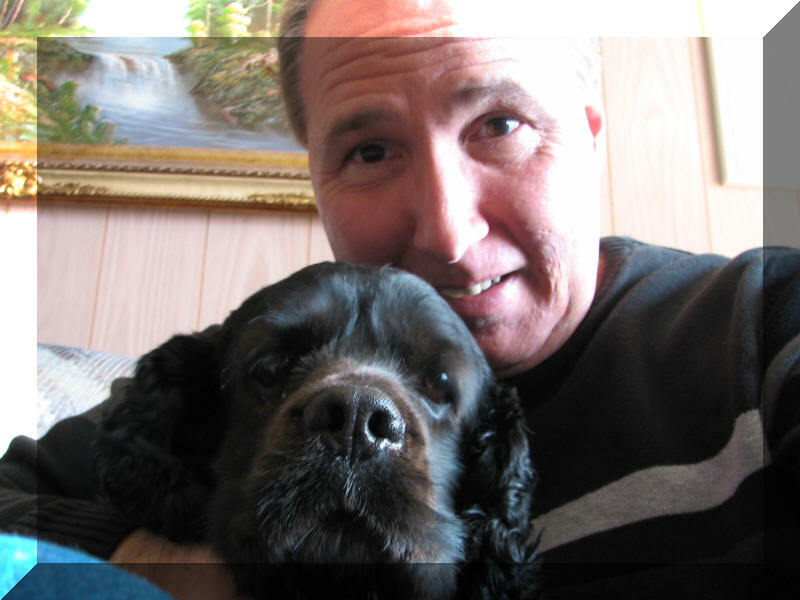 It started out really sad when we lost our good friend, Cody just a few weeks before his 14th birthday. Cody loved shrimp and he and I would eat shrimp together all the time. In fact we trained our Dad to feed us shrimp daily by parking ourselves in front of the frig at 5:30pm every day without fail and smacking the frig until we got some. I don’t eat shrimp anymore - in fact, I am on a diet now. I don’t like being on a diet much. Anyway, my Mom and Dad fell in love with the Cherished Cocker site where they found me and have been visiting ever since. 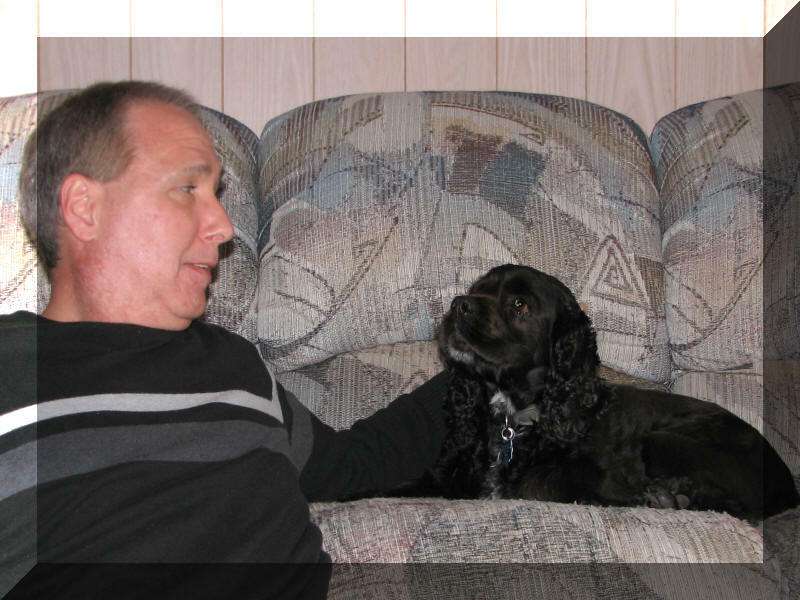 When Cody went to heaven, they found Tucker who had been left behind when his family moved. We all love Tucker and are really glad we found him because he is so much fun. He plays all day long and loves to play tug with me. He rarely tires but when he does he loves to sprawl out on my leather ottoman but that is okay because I am good at sharing. We go for walks together and chase squirrels too. About 6 weeks after Tucker came to my house, Duncan came over and he lives here now too. Duncan is a little bigger than Tucker and looks like he could be my cousin but he is not on a diet and Mom says he won’t have to be because we are eating healthy now. We do not have cookies any more or table food. Mom gets us marrow bones from the butcher and we love marrow bones. Duncan was afraid of everything and has since made friends with the vacuum sweeper, blow dryer and the mixer. He barks at everything new that comes into the house. He likes to cuddle in the bed and spoons real nice too. About 8 weeks after Duncan came to my house, Rosey showed up and she lives with us now too. 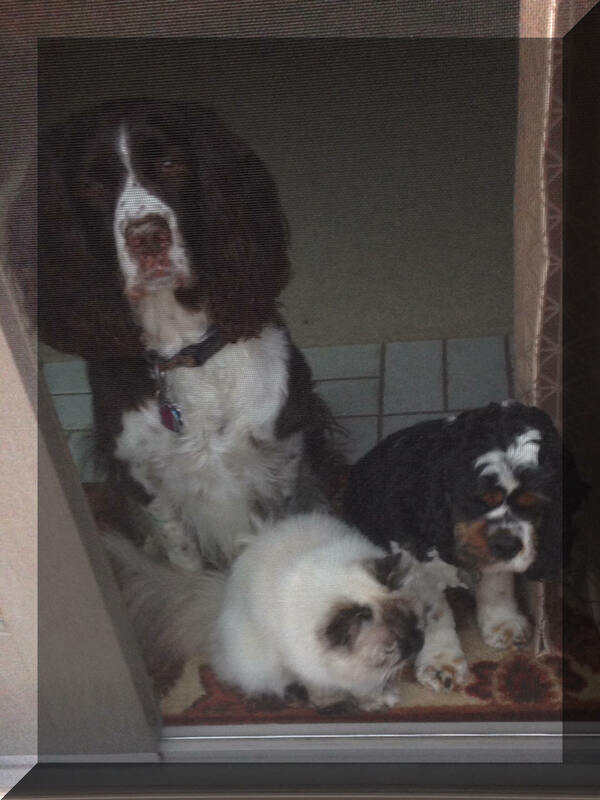 In fact my Forever Family consists of 5 cocker spaniels (including me) and 2 really cool cats named Spencer and Stuart. Rosey is tiny and can fit just about anywhere even under the bed. In fact, my toys went missing shortly after she came to my house and I found them (all of them) under my Mom and Dad’s bed. She likes to collect stuff. She likes to play too and she is no push over. She can hold her own in a game of tug; rarely wins but plays just the same. We are all really excited about Christmas because it is a holiday and there is no work on a holiday. We get to be home with Mom and Dad, we get presents and Grandma and Grandpa come over. We even get an extra meal of Turkey on Christmas too besides our breakfast and dinner. I am sharing a pic of my new friends in their Christmas sweaters and one of me in my antlers. Besides being really good looking, I am also a good sport ! That is all for now except we want to wish everybody at Cherished Cockers a Merry Christmas and very Happy New Year and especially Christine for bringing all these neat friends over to my Forever Home and making me and my Mom and Dad so very happy !! Cathi & John Majewski . 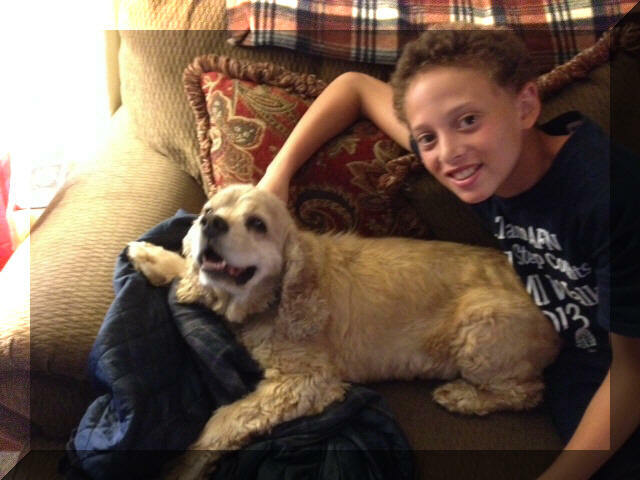 Hi here is a picture of Baxter with my 13 year old grandson here in Baxter's new forever home. 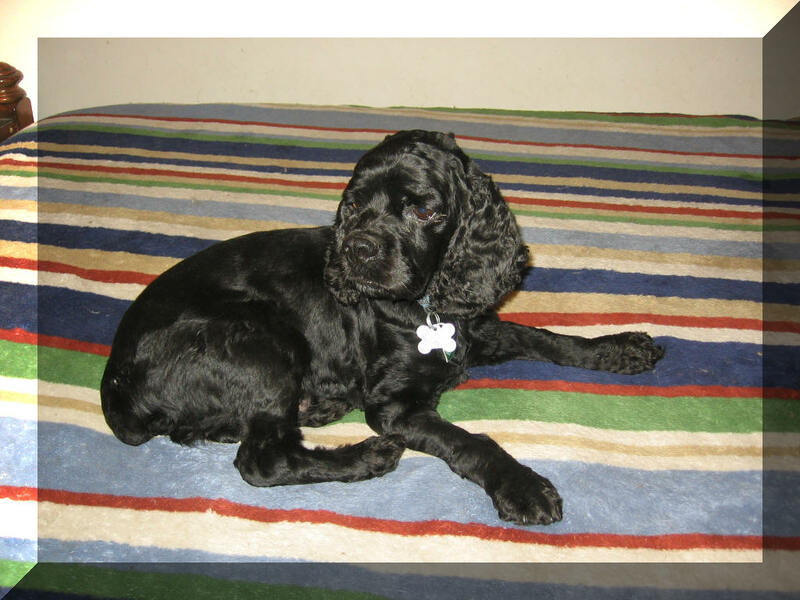 It is 2 months today that we lost our beloved Mickie who was also a rescued cocker who I got when he was 2 years. He had severe heart disease and was 9 when he passed. I knew that we needed another cocker to help us heal. Baxter has been that and more. He is very sweet. He loves attention. He settled into his forever home very quickly. It will be 5 weeks tomorrow that he came home with us from his foster home in Ohio. Baxter is beloved by his new family which includes my husband, my two adult children, their spouses, and our 6 grandchildren. He spends his days lounging on the sofa in my family room while I work all day. I telecommute. He makes himself comfortable on the bed at night. We take walks @ least twice a day. On weekends. 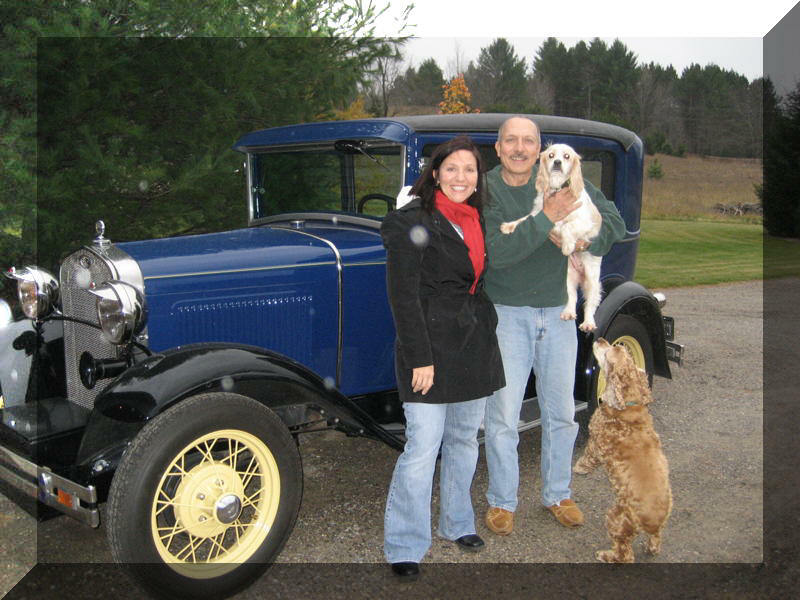 all of us head up to our cottage at Sandy Lake, Pa. including the adult kids, and grandkids, and Baxter of course. Needless to say Baxter is constantly being petted and hugged and walked while there. Hi, my name is Webster and I want to tell you about me and my forever home! I am an 8 year old puppy with lots of energy. When I was just a tiny pup I was named after the guy who wrote the dictionary cause I am very smart, just like him. I had been in my foster home a long time and really wanted a place allllllll to myself. So when my new Mom and Dad came too get me, I was a little nervous. But they had treats for me in the car and talked to me the whole ride home. When we got there, they let me explore the whole house! I was so happy not to find any other dogs or cats or birds or anything. I was going to be any only!!! I love to play ball, and so does my new Dad. We play in the big back yard and in the house, though we try to be careful inside. 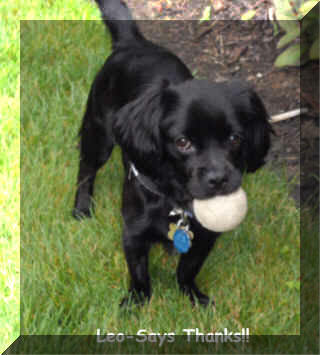 Sometimes he will use 2 balls at one time and that's really fun! They also have a park near the house and we take walks there on the trails and the beach. I'm not allowed to swim in the lake, but I can get my feet wet. I also like to ride in the car or the jeep, so I get to go almost everywhere with my family, except to work. I have my own blanket and pillow on the living room floor, but when I want to cuddle, I can get in the chair with either Mom or Dad, and they will rub my ears or back till I fall asleep with them. But, if they get a snack, I know they will share with me. I love popcorn and little carrots, and crackers with peanut butter, especially!!! At night I sleep in the big bed. Sometimes Mom puts her feet under me to keep them warm. I know I am very lucky to find this forever home where I am loved and spoiled. Being rescued is GREAT!!!!! Nick is one of our Rescue Dogs. We are Proud of him and his dedicated owner !!! More good news about Nicholas! Nick passed his therapy dog test today so he is now officially a therapy dog. He is wearing his Therapy Dogs United bandana in the attached photo. The Spitzig family has always been a strong believer in adoption of rescue animals ... there are just too many innocent animals in deperate need of loving homes and families. After the loss of our bloodhound rescue Jake in later winter, we wanted time to find the right "new member" for our family. We did a lot of research regarding dog breeds and what would be the perfect fit for our family and low and behold we came across Cherished Cockers Rescue in Ohio. I can honestly say that when we saw Jacob and read his profile WE KNEW HE WAS THE ONE!!! Immediately we contacted your rescue with the hope we could have a chance at adopting Jacob even though we were so far away. After filling out the application and having everything checked out - we were approved and could not wait for the day to come! 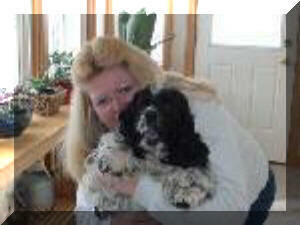 Thanks to Christine and Debra a week later he was on his way to Cambridge, Ontario and his forever home. Bringing Jacob into our family was not hard and has meant so much to all of us. He truly is a "heart breaker" in a good way. He was very timid early on but seemed to adjust rather quickly to his new surroundings. We could not ask for a better boy and he has become part of our family and we comment often how boring life was before he came. Jacob really looks forward to his lunch time "gang" walks every day and we often tease him about walking with his girlfriend Daisy! He is wonderful with everyone that comes to our home and while we are out and about. He loves car rides and is always the first one in the van sitting in the drivers seat! As a final note, I do want to share with you the significant impact he has had on our 12 year old daughter Izabella. Izabella deals with a lot at the young age of 12, she has 2 different congenital heart defects as well as being diagnosed with adolescent bipolar and compulsive disorder. Bella and Jacob have made a very unique and special bond ... we truly believe that Jacob knows something is different with her and that she needs a little extra attention. He has taken to sleeping with her almost every night and the 2 of them lay in bed every morning while she is supposed to be getting ready for school. They enjoy their evening walks together - just the 2 of them, it is so touching. Thank you again for allowing us to adopt Jacob and we look forward to many, many years with him. We will keep up updated. Our thanks to Cherished Cockers and the local foster who made it possible for us to welcome Enzo into our lives. He has brought much joy to us, and we think we make him pretty happy, too. Enzo is everything and more we were hoping for in a dog. He’s sweet, playful, gentle, adorable, funny and generous with his affection. 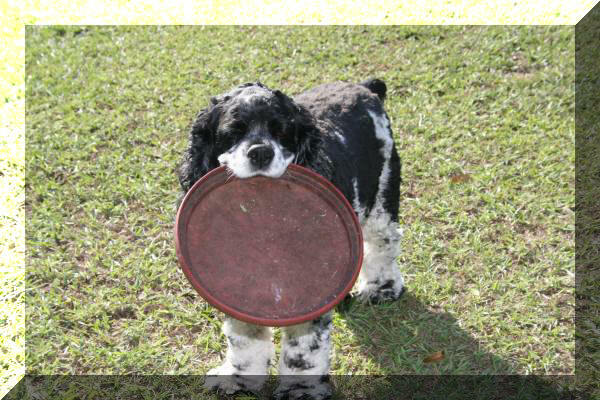 Since he’s smart and desires to please, he has picked up many basic commands as well as some just-plain-fun commands. Our family, friends and neighbors have commented on how perfect he is for our family, and it’s true. It’s like he’s been with us for years even though it’s only been a month. We’ve also been enjoying learning what Enzo enjoys. We’ve found that he likes snuggling at our girls’ feet in the car, chasing blowing leaves, playing hard-core tug-of-war and morning belly rubs. We look forward to seeing what he does in the snow! We can’t imagine our home without this sweet boy. He’s truly a cherished member of our family! Thank you, Cherished Cockers, for Enzo! because she was having aggression problems with their new lab. I knew he was coming home with me. He's been great with Effie, even getting her to start playing again, and he gets along with my cats and my mom's. He loves playing with her lab, too, and isn't intimidated by the extra 30 pounds she has on him. He is the sweetest dog and follows me everywhere. 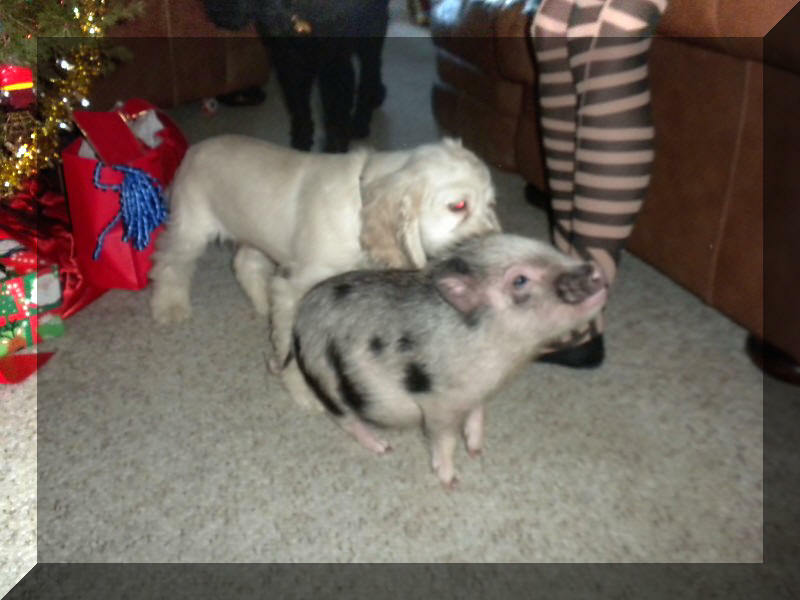 At Christmas, he was thrown into the craziness of our extended family and their standard poodle, Jack Russel Terriers, German shepherd, and even a teacup pig, and he did great! He went to the Woof, Wag, and Wine event in June at Grand River Cellars and behaved beautifully. We love going down to the beach, where he and Effie can run and play, although he's not a big fan of the water. Thank you so much for suggesting this puppy for me, and thank you to his foster mom, Coni, for taking such great care of him! None of us can imagine life without this sweet, super cute puppy! We have been having so much fun with Cooper that we have neglected to provide an update. This weekend we celebrated 3 years with Cooper and we wanted to share this update with you. Cooper quickly became a very important part of our family. Although, his largest hurdle was our cat, Halle. She hissed and wanted nothing to do with him for one year. 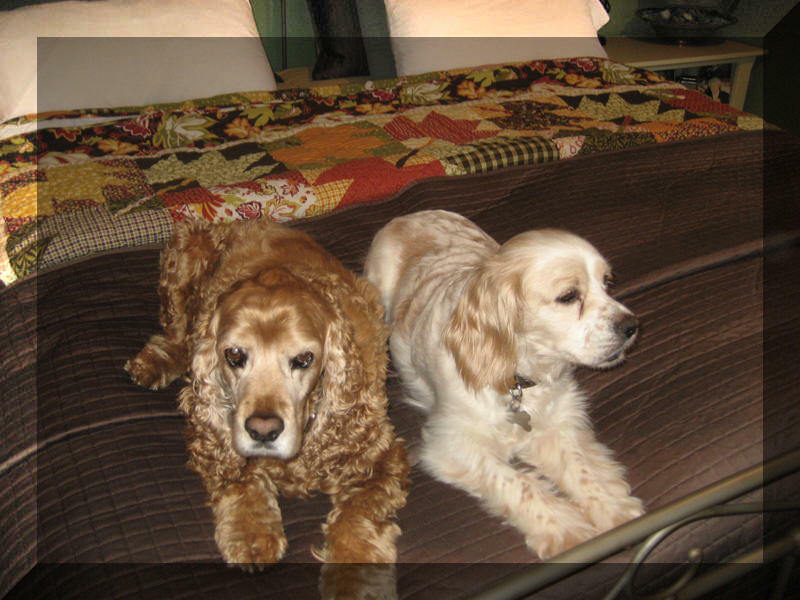 Eventually, even Halle came around and now sleeps in the same bed as Cooper. Yes, we accomplished complete harmony in our home and cannot imagine life without Cooper. Unfortunately, last Summer, Cooper got a little too close to a skunk and got sprayed right in the face. I can tell you NOTHING takes that stench away, including tomato juice, Dawn, baking soda, white vinegar, so called Miracle potions… absolutely nothing worked. The house smelled for about 4 weeks and poor Cooper carried that smell on his face for over six months. Cooper still loves to play and go for walks and his favorite toy is a laser toy. He will chase the laser endlessly. He loves to learn and has learned Sit, Stay, Come, Leave It and Give Me Paw. He never grows tired of showcasing these commands over and over again. When he is not chasing a ball or a laser, he loves to stalk birds, bunnies and squirrels. We love everything about Cooper and we are very thankful for Cherished Cockers. We wanted to take this opportunity to update you and extend our sincere thanks once again for this incredibly loving, loyal and awesome companion. You should know too that we are pretty sure, he is as happy with us as we are with him. 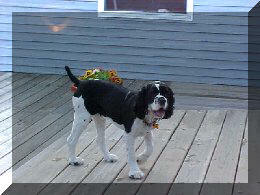 Thank you so much for approving our application to adopt Dakota recently. He is just beautiful and a delight to own. When we collected him from his foster home we were told he would lie in the back of the car and go to sleep. Within five minutes of leaving Denise' Ken and I were smothered in big sloppy licks and then he firmly established himself on my knee in the front seat. We had no difficulties with getting him over the Border, thanks to all the paperwork you sent us, and on arrival home he eagerly explored the house and garden before taking over the couch - now his domain. Within an hour he was lying flat on his back, feet in the air, fast asleep and utterly content. When he's awake however he's full of life, bounding everywhere just like a big energizer bunny. He enjoys a 'rough-house' and thinks Ken is his big playmate.. Not knowing his history we were prepared for it to be a case of easing him into his new life, but he seemed to know this was his permanent home and has settled down extremely well. He spent the first few days sleeping on my bed although he has a nice bed of his own. I spent a week coaxing him to use his bed, telling him it was Dakota's. So now, at night after his routine of cuddles and big licks he is spending most of the night on his own bed. Our daughter and her husband saw him for the first time last week-end, it was love at first sight, and we said we'd have to search their car before they left, so that he wouldn't disappear to Newmarket! Considering we have only had him a month he is completely settled in his 'forever home' and we feel blessed that we decided to adopt an older 'rescue dog' We're enclosing some photos of Dakota , which you are free to use in your Newsletter along with any part of our letter. We are so pleased to have chosen Dakota, he has such a lovely temperament, we think he's wonderful. Whilst stroking his back it somehow didn't feel right, so we took him to an Animal Chiropractor. She said his back end is twisted, and as a result his leg and hip muscles haven't developed properly. She doesn't think he has been abused, but neglected, possibly confined or tied on a short rope which only allowed him to move a little in all directions. She is working to adjust his spine for him to avoid future problems. Best wishes, Thanks for all you do for these animals. I thought you might like an update. Molly isn't the same dog that you gave me in Nov. She has adjusted so well. She is a snuggle puppy! And FULL of energy! I call her Fruit Loop! Christmas was a little stressful for her, what with her Daddy's huge family. But I was extremely proud of her. Everyone thought she was quit the lady. Molly travels wonderfully! & made a friend, Muffin. The 2 of them played & played. She goes to Doggy Day Care once a week. This has been wonderful. She has made friends & is learning that Mommy WILL be back. She loves going. Molly loves the snow & has acquired a little wardrobe. She even lets Mommy put bows in her hair. The cats are adjusting. Gryphon doesn't care anymore & has even made an attempt to play. Camilla? Well, shes tougher. She has finally come out of hiding & hisses only once in a while. lol The house breaking is so so & she will not go outside without someone??? We are working on that. If I have forgotten anything, please feel free to contact me. Molly is a treasure & has brought joy back into my life. Chase (previously named Willie) is doing great. He is boss over our cats and loves it. He will randomly and spontaneously chase them. He was not able to tame Pepe (the big cat you met when you were visiting) so he gave up and cuddles with him instead (see photo). 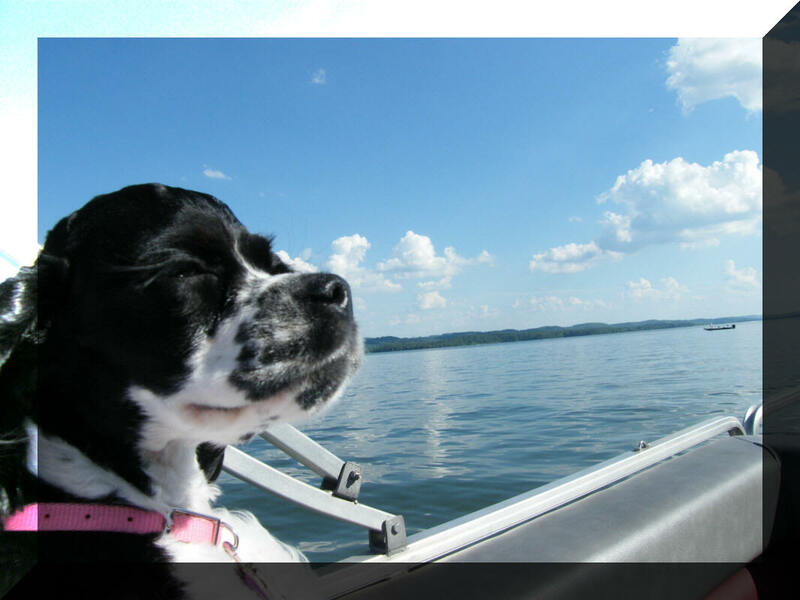 He loves our property in Streetsboro because he gets to pretend that he is an old sea dog (see 2 photos of him sailing with my son). Much to our surprise, we quickly learned though that he will try to jump in the water to go after the Canadian Geese that land on the water. When Chase first started living with us, he had a lot of accidents. We took him to a dog training class at CoPaw Cabana. It helped a little bit. However, at Christmas I hung reindeer sleigh bells on our door; a tradition I have been doing for years, and he started ringing the bells when he wanted to go out. Chase went for a hike at Richie's Ledges and he was green from all the burs he got into. There is also a photo of him after he played with the kids in the snow. This was our first lesson that mini snow balls will form on a Cockers coat if you don't keep it trimmed short. And finally, there is a cute photo of Chase peeking out our kids club house window. Our new house also has a lake so he will get to continue to sail and chase Canadian geese. I hope all is going well with your rescue efforts. Keep up the good work. You are awesome!! First, I decided to give him the good Irish name of Clancy. It fits him perfectly and he already responds to it. Well, I am absolutely in love with this little dog! I think he has the most beautiful face I've ever seen and what a shiny jet black coat. He is such a sweet, bright, funny fellow whose tail is always going a mile a minute, yet he has a calm, quiet disposition. 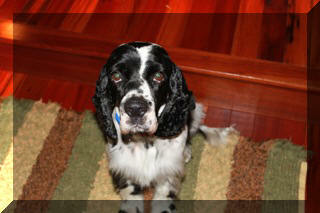 Clancy is also a real gentleman -- he takes treats gently with his lips and doesn't jump on anyone. He was a great traveler on the way home, curled up in the front seat beside me. We take two long walks every day and he is responding well to leash training. Very smart boy! He also lets me clean his face and ears every day and sits perfectly still while I brush him and use the clippers. So easy to groom. He has settled in so quickly and easily. He sleeps on a big comfy dog bed in my bedroom, which he just laid right down on the first night like he knew it was his. His main goal in life is to be about one foot from wherever I am. In the evenings, he curls up beside me on the sofa while I read or watch TV, and he seems so content. One last thing -- Clancy loves piano music! Every time I play, he comes running and lies down right beside the piano and never moves until I stop playing. All my other Cockers loved piano music too. I can't imagine a more wonderful match. I've owned and loved black Cockers all my life, but this little guy is extra special. What a love bug and good, good boy. Many thanks to you, Rachael and Laura for a great adoption! 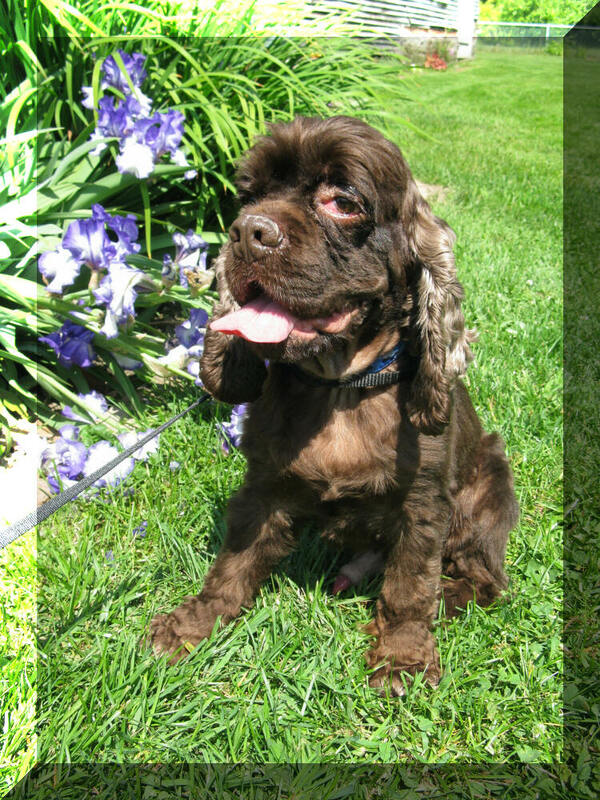 I was looking at another cocker spaniel, actually, but that adoption ended up not being the right fit for me. Christine emailed me about Hanna and I instantly fell in love with her story and her pictures on the website. I started talking to Hanna's foster mom about Hanna and all of her stories about what a wonderfully sweet dog she was made me so excited to adopt her. Hanna's was a stray - two people found her on the side of the road. I can't even imagine getting rid of this dog or not doing anything possible to find her if she was lost. When I went to pick Hanna up, she immediately came over to me and nuzzled up to me so I could pet her. I was instantly in love with her. She is the best dog ever and honestly, I cannot imagine my life without her. We adopted our dog, Brodie just a few days ago Brodie is wonderful !!!! He has adjusted so well. Its hard to believe that he has only been here a few days. He fits in so well with our home I can't imagine him not being here. I hate leaving for work in the morning but I can't wait to get home to see him. Even the cat likes him now. We feel so lucky and blessed to have him as part of our family. Thank you and Cherished Cockers so much for making this possible. 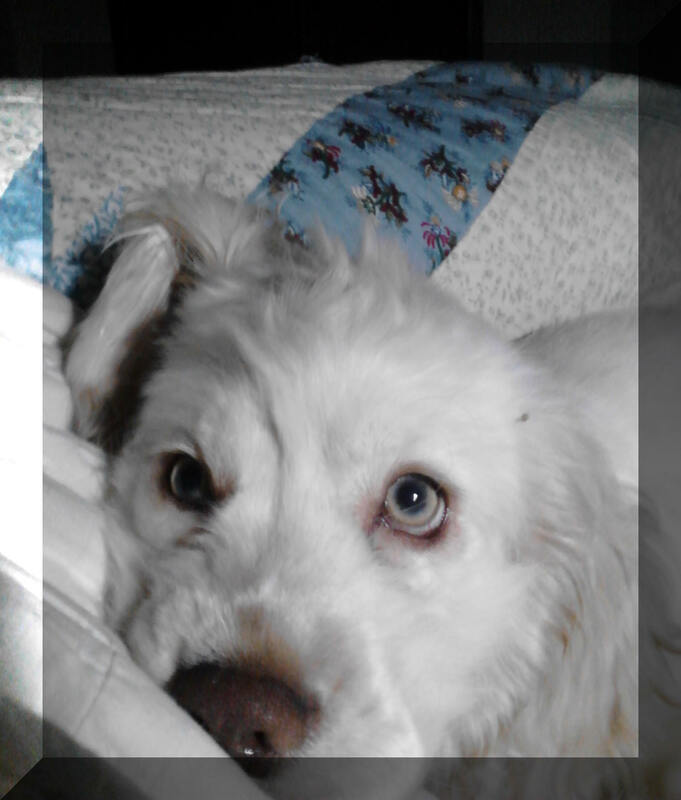 Wanted to send you a new picture of Blue. We adopted our dog, Carson, 4 weeks ago. He was about 10 weeks old then. 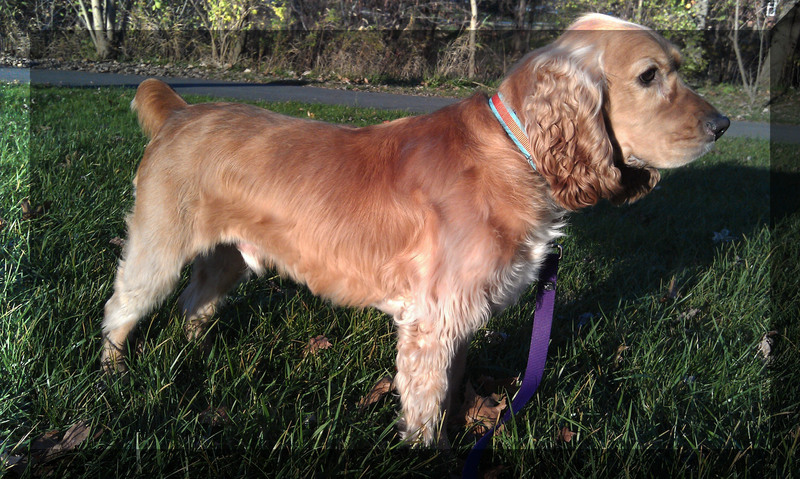 I had always wanted a Cocker Spaniel, and happened to see an event on the news held by Cherished Cockers. I followed up online and saw him the next day! He came to us a few days later. We had to have him- he was so precious. At first he was timid, but within 3 days he came out of his shell and was following me around the house and playing with the kids. We repetitively took him outside to potty and he was consistently sleeping through the night and going to the bathroom outside after one week. Now we are focusing on socializing him and trying to tame the nipping and naughtiness of our puppy. He is doing great with training and is an affectionate, sweet little man. He is a wonderful addition to our family and is bonded to me now. I have adopted the most perfect pet from Cherished Cockers and the experience was and is wonderful. Not only did I get my boy Derby but I met some wonderful people. 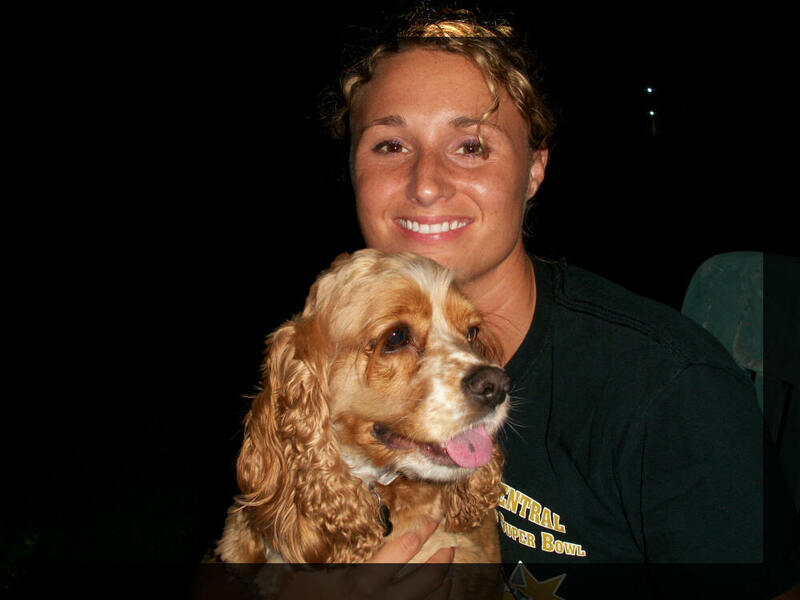 Jami Mitchell Derby's foster mom is a precious, caring dog lover who goes way beyond the call of duty. We have stayed on touch since we met. I keep her up to date on Derby's latest pictures and adventures. My sweet boy is 9 months old and has had a very hard start in life but despite that he has a heart of gold. He loves everybody. The extent that Cherished Cockers people went to to save his life and restore his health warms my heart! 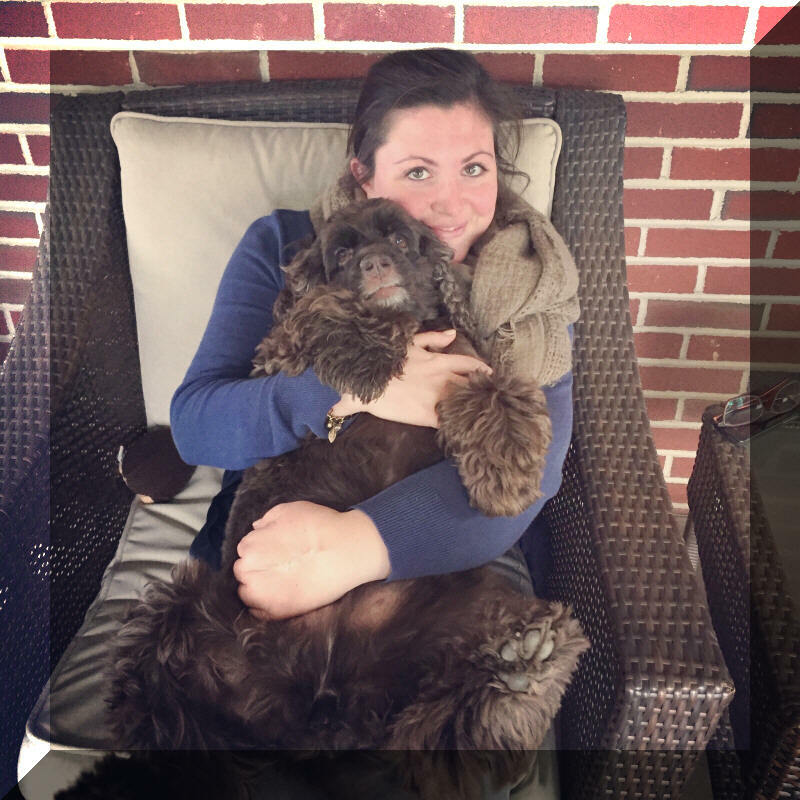 Derby is a Boykin Spaniel that ended up in a cocker rescue and I believe his little guardian angel put him with those loving folks until he could find me and his forever home. 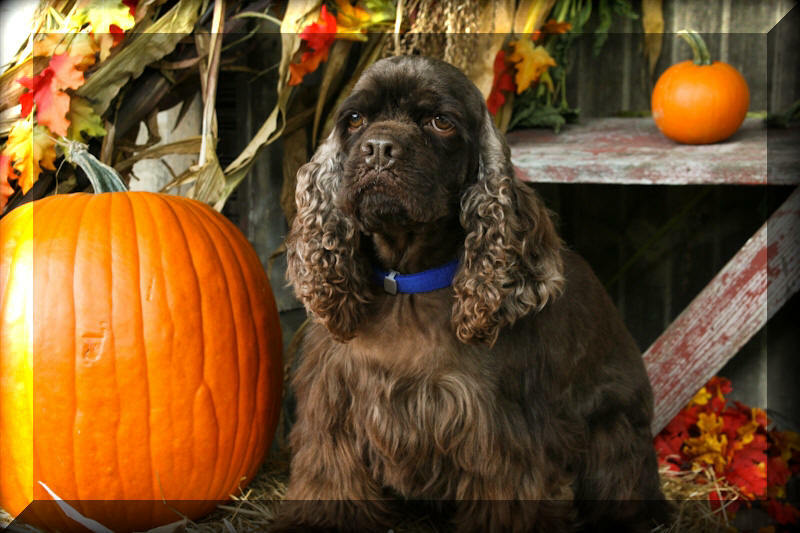 I saw this picture on the internet under the Cherished Cocker site and fell in love with this little boy. His name is Midnight and he is about 8 months old now. He came from a man who bred his cockers and then could not place them. When he went to his foster parents he was petrified of people and wouldn't come out of the crate. His foster family also had other dogs so he learned to love people from his foster parents and how to act from his foster brothers and sisters. His foster family brought out all the loving that Midnight holds inside. They had him for about six weeks and he made wonderful progress. When I first met him he had spent hours traveling with folks he didn’t know to get to the house where I met him. He came into a house that had about five resident dogs and he came in with a person he didn’t really know. He was a little shy at first but within a couple minutes he was sitting on my lap and watching what was going on. He took a couple minutes before he bestowed my first kiss and it was a mutual love affair from that point on. I can’t emphasize enough what a joy getting Midnight has brought into our household. 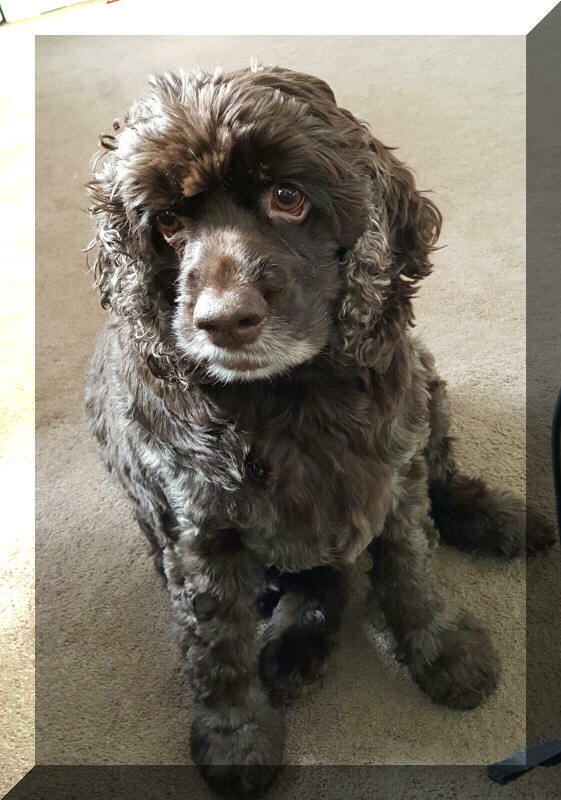 In January I had to have my 13 year old English cocker put to sleep. Since I live in Rochester, New York I planned to wait a couple months until good weather before getting another dog. However, it was immediately evident how lonely life can be without a friend meeting you when you get home. I had heard about dogs needing rescue from my vet and the local SPCA. The people at the vet’s recommended looking online for rescued cockers. 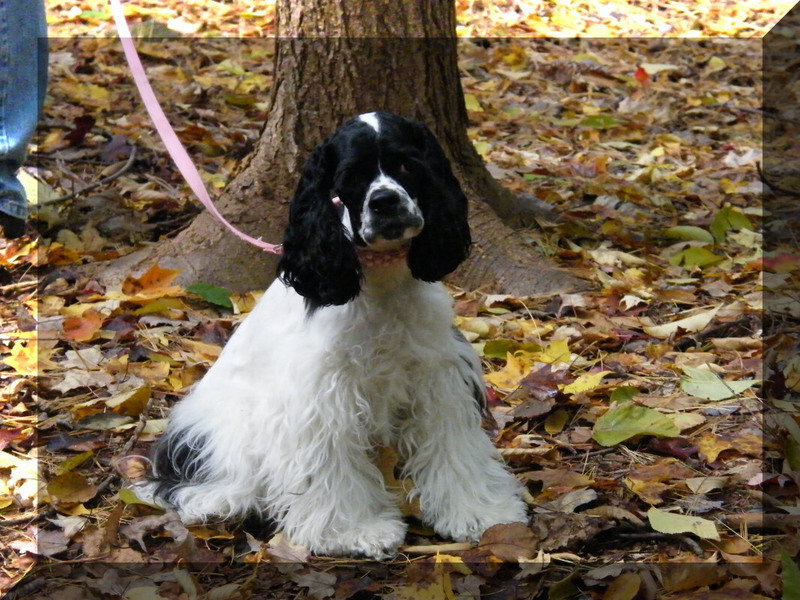 After reviewing pictures of dogs from all over the US, looking at pictures of cockers of every age from infants to elderly I decided I needed a dog old enough to have already been house trained but young enough to be lively. It turned out that most of the pictures of the dogs I liked were from Cherished Cockers. So I chose a six month old all black boy puppy named Midnight and contacted Cherished Cockers to apply for being an adoptive parent. I did check with the SPCA and my vet to research what I should be looking for in a reputable group, one with the interests of both the owner and the animal at heart; a group that took the responsibility of finding these animals a good home very seriously. I am convinced I found that in the folks who work with Cherished Cockers. Everyone I talked to was informative, accurately defined the dog’s temperament and made sure it would match what I was anticipating. They thoroughly checked out Midnight’s future home and verified with my vet that I would make a good parent. They accurately described Midnight’s good and not so good points. Midnight is an absolute delight. He has been here now for a month and is always happy. He is never mean to anyone. He is cautious when new people come in but has only barked twice at a couple people. However he never has gotten nasty or even growled. Last week was his first visit to my vet. He was shaking all over when we first got there but allowed the people to come over and pet him. By the time the visit was over he was smiling at the vet and the people who worked there. One of the ladies who held him while his micro chip was being implanted made it a point to come out and tell me what a loving little dog he is. That same week he went to the groomers for the first time. It almost broke my heart to leave him there (he had that “Oh, no, you’re not leaving me are you?” expression on his face) but I did. The groomer said he was wonderful, a little scared but never nasty. She said he would get used to it in the next couple visits. You could almost see the smile on his face when we came home. He is always smiling; you can see it in his eyes. When he runs in the yard he is full of this overwhelming joy and exuberance. He bounds around in large circles, running so fast his ears fly out almost parallel to the ground. When we come back in he has to give me bunches of kisses just to say he’s glad to be there. He kisses everyone when they come home but stays with me the most. He sits beside me when I watch TV and sleeps on the bed at night. He also has this propensity for neatness. He has at least two chewy things on the bed at night. Before he is ready to sleep he uses his nose to push each one around on the bed until he finds the exact spot where he wants it for the night, he lines the others up in parallel with the first and only then he lays down and goes to sleep. He tends to keep his things together downstairs as well, taking one toy at a time to play with and usually ending up with things ‘put away’ before going upstairs to bed. He is young and full of life and love. Just what our home needed. Thank you Cherished Cockers. 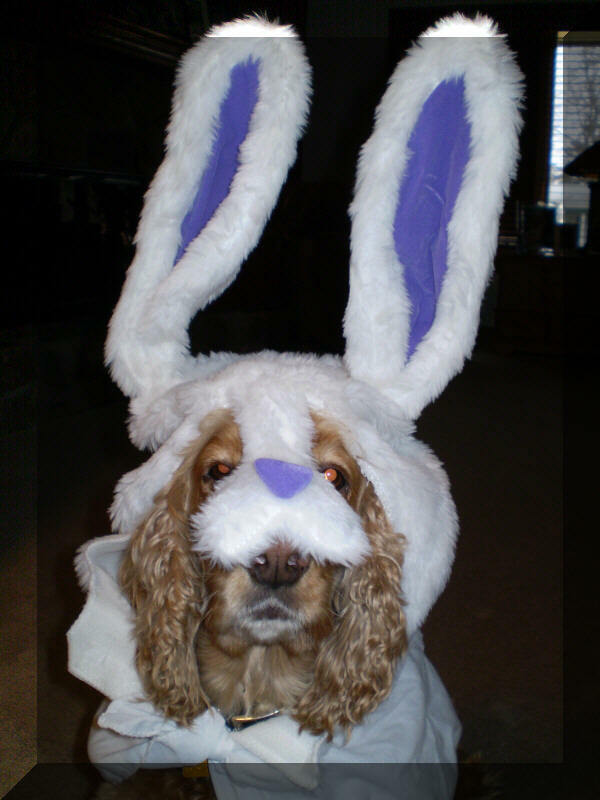 Just wanted to say hello and wish both of you a Happy Easter from Jorge. It has been 4 months since Cooper joined our family and he is doing wonderfully. He is no longer crated and has the run of the house with our other two cockers, Doogie (4 yrs.) and Cody (9 yrs.). Cooper has brought out the puppy in Doogie again and the two of them romp and play daily. 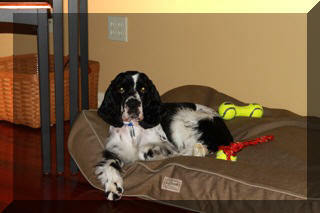 Cooper has settled in very nicely and has learned to expect a daily walk and ball game and fully enjoys both. He couldn't be more well behaved, gentle, loving and an all around great dog and companion with a lot of personality. He and Halle (our cat) are still working things out but she is no longer hiding from him. He seems confused by all the hissing she does at him but he walks up and gives her a big kiss just the same. He has definitely livened things up around our home and we feel truly blessed to be his forever home and companions. All the best and our thanks for providing us with this little character ! I love my new home! I am very spoiled and loved! I have many new toys and the run of the house. I am learning new things and behavior. Mom says I am doing well. She is taking me to school next year. I don't know what that is but it will be a new experience for me. I have a great big yard and it's fun here. I have 2 beds of my own and a blanket. I have so many toys I have a basket of my very own to put them in. (well mom puts them in it) She says I need to learn to put them in the basket too. I tolerate Bridgette but I am jealous of her. She runs around more now that I am here. Something about missing some dog named Prince before I came here. I have a big crate and dad is going to build me a new wood one that will look like furniture. (whatever that means) Thanks for letting me move here. I hope you are all well and you found your puppy. Merry Christmas! Carson Thanks for all your work! Well Leo made his first beauty trip and did real well. He now has his own set of dog tags, dog license, and yes his very own scarf. He did well getting his bath and at the vet. He is adjusting well and is the talk of the neighborhood as neighbors come out to meet him. He is swamped with toys and likes the stuffed raccoon the best. He is well mannered and already will go to the door when I pick up his leash. He likes to play bounce ball and we have to laugh since he seems never tire out. He is sleeping well in his new crate and he hides under the pillows on our bed hoping to stay there. The Vet sees only minor ear problems and he is adjusting to us very well. He is not answering to LEO yet but he sure is a little lion hearted doggie. He startles with loud noises and voices but settling down more each day. He is a keeper and I hope he wants to keep us........yes he has a great personality and it shows plus he charms your mom and races her to her chair every time he can but then he settles in to sit and watch TV on her lap. Thanks again for all the effort you did and to the Rescue Service. 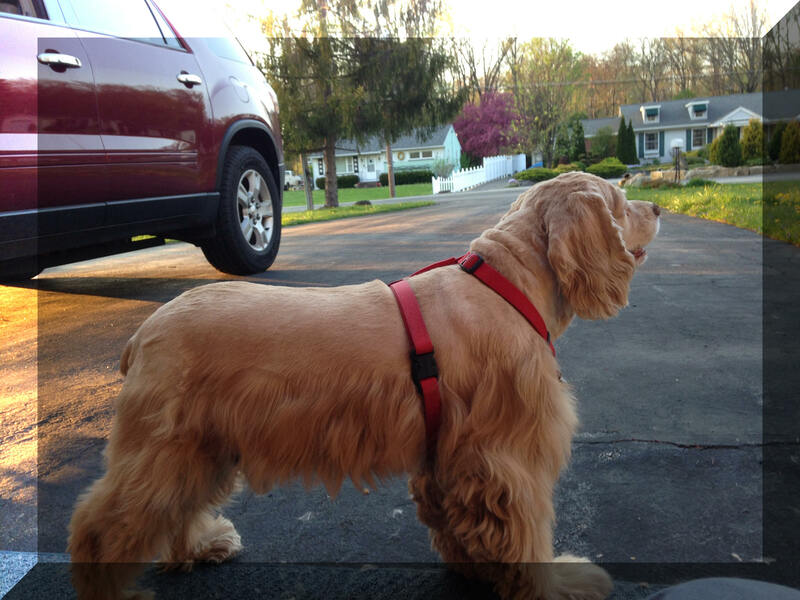 We certainly would like to thank the lady that took the time and funds to save Leo from his former owner. Leo is learning people care and knows we are concerned about animals. Leo has big shoes to fill as our other animals were all great and still have their place within our hearts......Leo will get it done as he seems to be all heart. We adopted a beautiful chocolate cocker named Parker. He has become a part off our life and my constant shadow. The only time he doesn't try to beat me out the door is when I go to work. He seems to know he can't go. The redness from the cherry eye surgery has disappeared and he has 2 big brown eyes. When we first got him and I came home from work he would wag his tail now he wags his whole back end! He has been camping in Canada and Pa with us. The first time I took Parker to the vet all the girls loved him and wanted to adopt him themselves. He is good with the 12 grandchildren that visit and will even walk right up and make friends with our sons 2 cats (they are getting used to him). Thanks to the loving people at Cherished Cockers for making these wonderful pets available for adoption. We are the lucky ones who adopted Cocoa from Cherished Cockers. Recently, my Mom adopted a 6 month old cocker puppy, Daisy, and I fell in love. 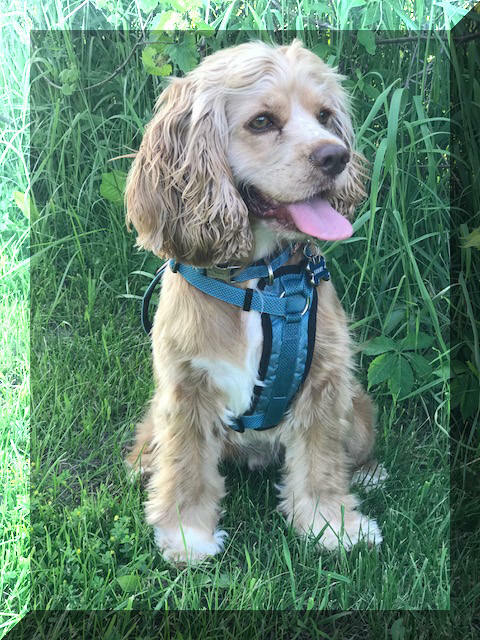 We didn’t even know we wanted a cocker spaniel! Once we found Cherished Cockers we knew we found the right rescue. 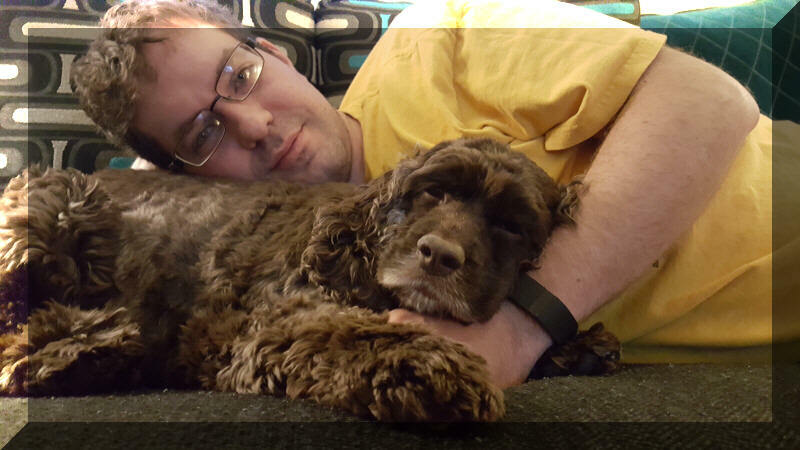 We adopted Cocoa and she is a wonderful dog who fit into our family seamlessly. She even gets along with our very cranky rescue cats! Cocoa is a wiggler and does full body wiggles for anyone who comes to our house. Cocoa is much loved, petted, and played with. Why anyone would have given up such a wonderful dog is beyond me. Cocoa is the center of our home life and loves to ride in the car. We take Cocoa everywhere. Cocoa is a true Velcro cocker and we wouldn’t have it any other way. I can’t thank Cherished Cockers enough. 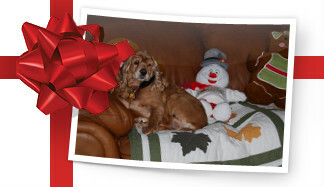 Your organization is wonderful and Cocoa’s foster parents were an inspiration. December 2008 was a tough time for me. 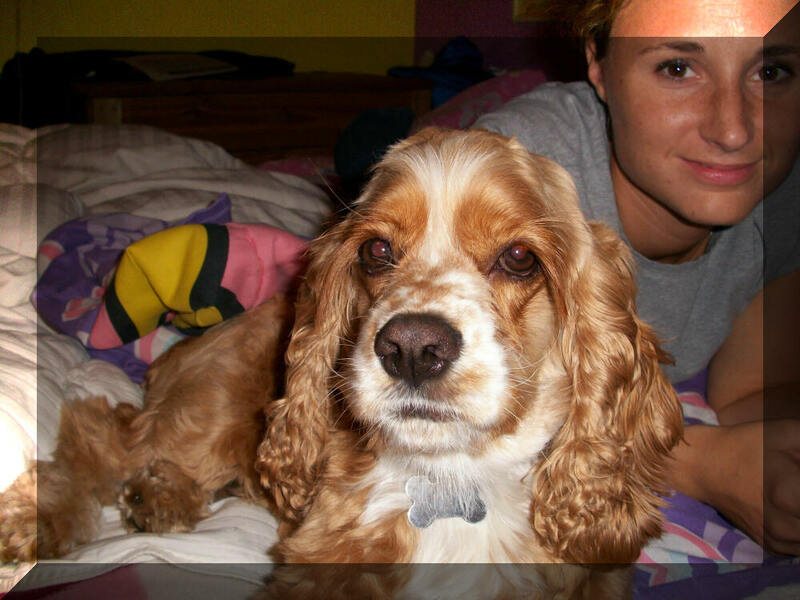 I was missing my cocker spaniel, Missy Mershon, who lived to 14 years and left me in 2006. I had already adopted Tori in 2004, who was left by her owners in a vet's office for three months, matted and in a kennel. Tori and Missy were my life! 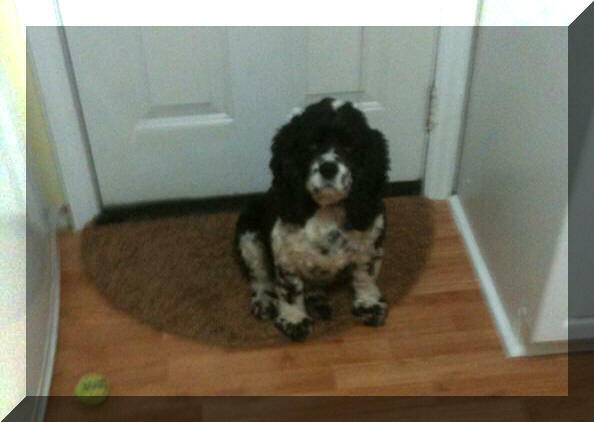 So, missing my Missy girl, I started looking on Petfinder.com. At this time in my life, I wanted a young cocker. That is when I saw a very small cocker spaniel, the runt of the litter, named Holly, on petfinders.com. I automatically fell in love with her! I contacted cherishedcockers.com to find out how I could adopt her! There were cocker spaniels in the newspaper want ads, but I fell in love with Holly. After paperwork with Cherished cockers and numerous telephone calls, I was the proud owner of a precious little girl. 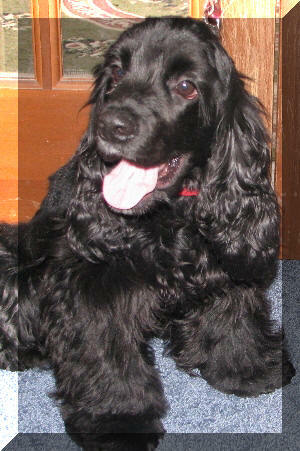 Now, Holly, (renamed Julia Mershon after my grandmother) is almost a year old. 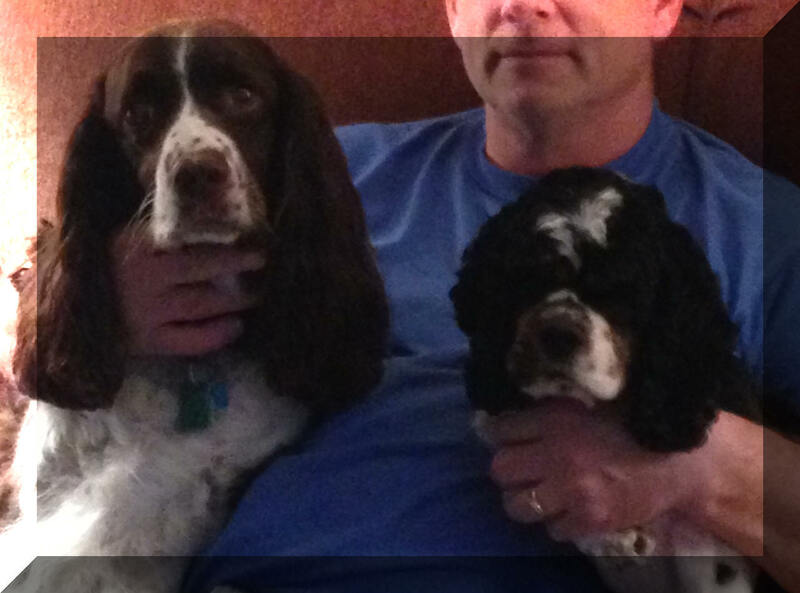 I commend the men and women of cherishedcockers.org for their commitment, dedication and love of cocker spaniels. After adopting Julia, I have even become interested and helped transport two cocker spaniels from Texas to Georgia. Julia is my baby girl and I thank Cherished Cockers every day for her! Erin and Sara are both very special to me!!! 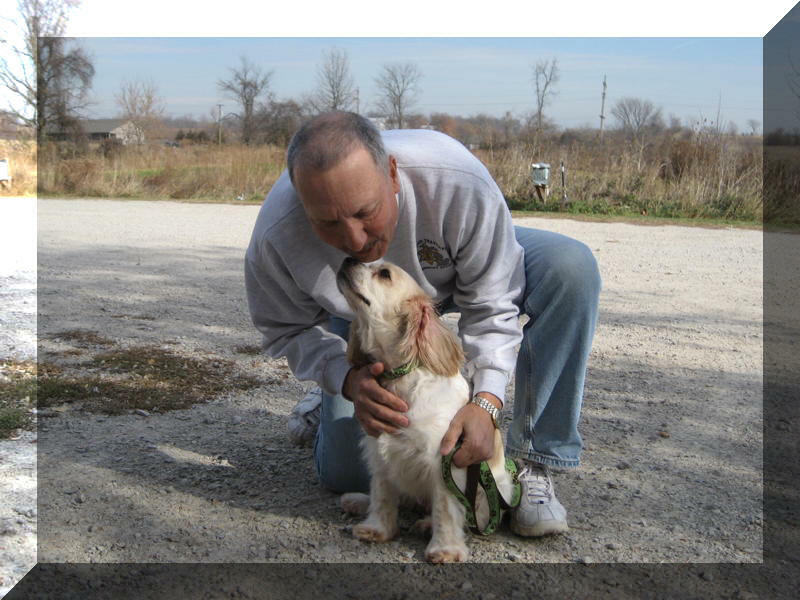 Bob & I can't thank you enough for letting us adopt Mollie. You can rest assured she is being well cared for. Mollie is more than just a puppy to us, she is so much a part of our family. We don't know what it would be like without her. When we lost our first Mollie, we never thought we would get over her not being here. It still hurts because she was taken from us too soon, but our new Mollie is more than we could have hoped for. She is so loving and always giving us kisses. We have some bells near the door that leads to the fenced in area for the dogs. Mollie will go over and hit the bells with her paw when she wants to go out, she is so smart. The best part of all of this is that she really loves us. It's been a week since we met Hayley and picked her up from her Toledo transport mom, Deann Matthews. We wish to thank her and the rest of the "transport team" for saving us lots of miles since we live in northwestern Michigan near Traverse City. It was a long day but SO well worth it. We have added a new family member that truley is one of the sweetest and loving dogs we've ever known. Hayley joins our 12 yr. old cocker Darla and Harold the cat who basically lets us all live here. 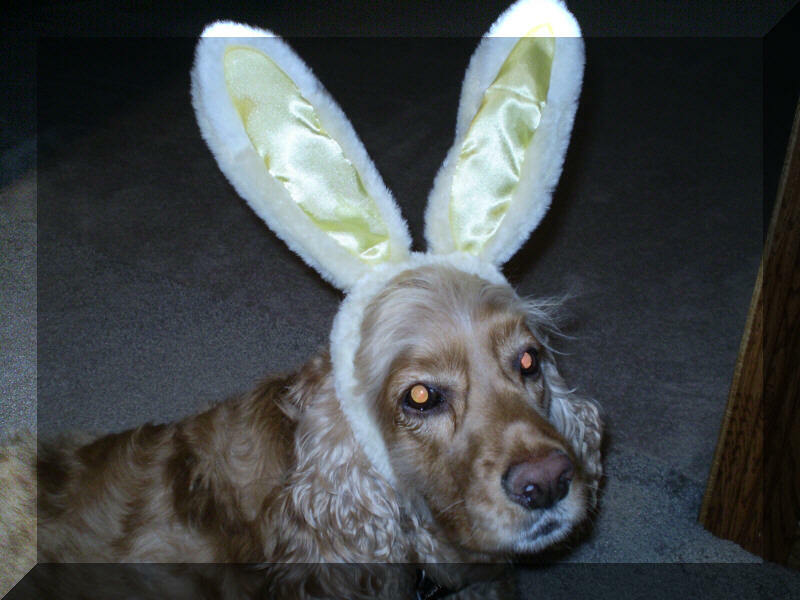 Katie and I had recently lost our other cocker, Molly, and frankly I was having more difficultly with her passing than I thought possible. After three weeks had gone by, I relented to Katie's suggestion that I look at your website. I did so while she was gone so she wouldn't know in case I still felt that no dog could replace Molly after browsing at all the cockers available for adoption. As I was looking at the photos, one immediately stood out. It was Hayley and her resemblence to Molly was unbelivable. At first I felt guilty trying to find another Molly rather than just looking for a new pet. But after reading her bio and seeing all the amazing similiarities I began to wonder if this was meant to be. When Katie got home later that evening, I told her that I had been on your website and had come across a dog that I couldn't get out of my mind. When I told Katie her name, she asked me to go to the computer desk and open the drawer and read the two names she had written down a few days earlier. One of them was Hayley. I knew right then and there that we were going to pursue her adoption. The next week seemed to take a month....we were so anxious to meet Hayley and bring her to her new furever home. We met Deann in Ann Arbor (that's the town that used to have a football team) and brought Darla with us so they could get to know each other a bit. After a couple of growling encounters, the ride home went well. When we arrived home, I was curious to see Harold the cat's reaction to his new sister. He was at the door when we walked in and was as nonchalant as I've ever seen him. I honestly believe he thought, and still thinks that it's a slimmed down Molly. In the week since we've had Hayley, we've seen many of the same traits that Molly had. We must now pick up the cat food as we had to when Molly was here. She loves to eat...gotta be careful we don't overdo it. She thrives on attention and appears to be happy 24/7. Her little nub is constantly wagging back and forth. We made a vet visit on Tue. to have a couple of things tended to: a rash on her belly that she constantly scratched, a minor infection in her left ear and an irritated pee pee area. After a steriod shot, some anti biotics, and some otomax for her ears, she is doing great. Her sleeping quarters soon became our bed and our ten acres is too good to be true, according to her. Our morning walk seems to be her favorite part of the day, other than feeding time and she loves the northern Mi. smells. Rest assured that Hayley has found her furever home. Thank you so much for bringing her into our family! Benny is just wonderful! He has quickly won our hearts. I've lost 10 lbs. running with him, he's a wonderful running partner. I'm thinking of getting him Rescue Dog certified, he is so smart and learning quickly to sit, stay, play dead, stay down, sit pretty (on his hunches), go to his bed, stay out of certain areas, and in general just how to behave. You're right that he loves to ride in the car, and is so quick to settle down. He hardly ever goes in his "condo" because I can safely leave him home alone and he behaves well. Thank you again for everything. He is such a joy to have in our lives. This is Adrienne Harris. I adopted Brody "Snoopy" from Cherished Cockers in November 2008. Just wanted to let you know that he is still doing great. I am so blessed to have my Brody boy. He is still acts like a silly boy and I love it. He enjoys chasing after his two sisters, the occasional squirrel that comes in the backyard, snuggling in bed at night and snoring like a lumber jack! Thank you so much for rescuing this little guy for me. Just wanted to give you an update on our precious boy Louie! He's been with us for about two months. We searched and searched for the right dog for us, and he is definitely the perfect fit. Everywhere we go, we receive so many compliments on how cute and how well behaved he is. He was the star of his obedience school class and he just graduated this week! We love every one of his little freckles and the way he snores and sleeps in crazy positions -- heck, we love everything about him! We are so grateful to all of you for the amazing work you do trying to find forever homes for dogs like Louie. We can't imagine our lives without our little fur baby! We'll keep you posted on all of our adventures! I am e-mailing to say thank you. In April of 2009, I adopted Jay through your organization. Jay was fostered with a great lady named Deanne, and although I would love to thank her personally, due to a computer theft, I have lost her e-mail address. Jay has become an absolutely wonderful addition to my family. I live in London, Ontario, and at the time that I adopted Jay, there did not seem to be many rescue cockers in my area, so I found Jay, and decided that a drive to Ohio would be worthwhile. Although Jay was not the dog that I had originally inquired about, she realized that he would be a better fit in my family, and she was so right. 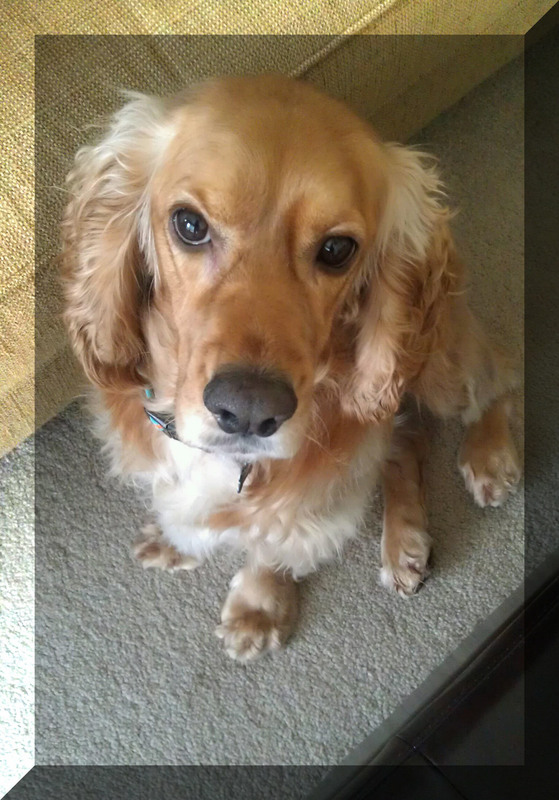 He rapidly became inseparable from my other cocker, Maggie. My father is in a long term care facility, and every other day when I visit, Jay comes with me. He is probably the most popular visitor that goes there. Everyone just loves to see him coming, and he is so calm and well behaved that he brings joy to everyone he meets. If Deanne is still with your organization, I would appreciate if you could pass my appreciation and the attached photos along. Thank you again, and wishing Cherished Cockers all the best in the New Year. As you can see, they let me lay wherever I want too..and when they say its bed time, I lead the way to the bedroom and am the first one in bed (with them). I love the food and have not had an accident in the house..Dad takes me out often and we romp in the snow!.. They have left me in charge, and I am waiting at the door for them when they come home! Thank you, Christine, for finding me a home with these people..they really love me. 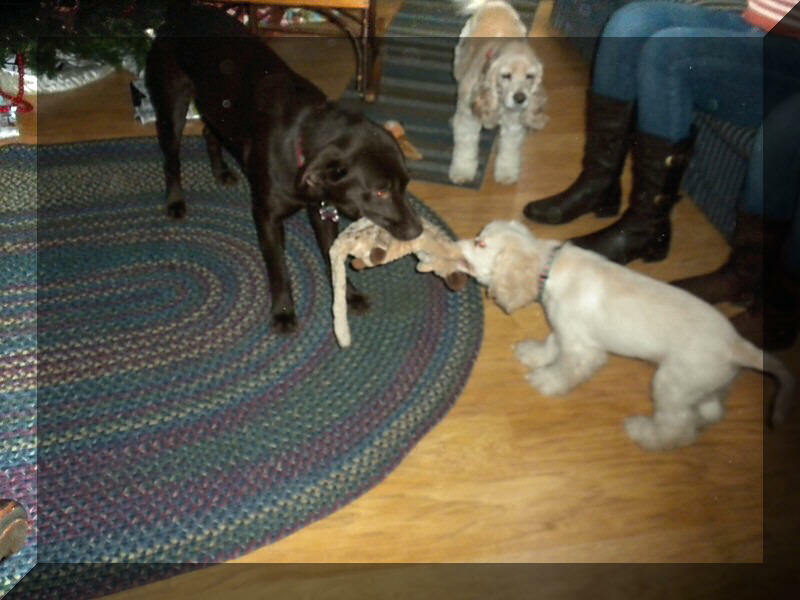 I arrived at Christine's home on January 22nd to meet the dogs that she was fostering. As I was becoming acquainted with them, into the room walked Coal, a very handsome black cocker. He had just arrived at Christine's home an hour earlier. He had been rescued that day from the Mahoning County pound, just hours away from destroyed. Of the dog's that Christine had at her home, it was Coal whom most intrigued me. Christine asked me if I would like to be a foster home for Coal. I agreed that I would like to do so. I was not prepared to bring a dog home that evening and told her I would come back tomorrow morning to pickup Coal. As I was putting my coat on and getting ready to leave, I glanced down and Coal was sitting at my feet wagging his little stump of a tail with a look on his face that said "please take me with you". I told Christine, " I can't leave him. He's coming home with me tonight"
Over the next few weeks I attended to a number of medical issues that Coal had and also brought him to the vet to have him neutered. It soon became apparent that Coal was a wonderful dog. He possessed all the qualities that I value in a dog. It was as if I ordered him built to my specifications. I knew that I could never give Coal up and that his foster home was going to become his Forever Home. Coal is doing very well in his new home. He is a friendly and affectionate little guy. He loves to play fetch and keep away with his balls and various toys. As much as I have grown to hate winter, I sure enjoyed playing in the snow with Coal. He loves to chase snowballs and romp through the deep snow drifts in my back yard. We go for long walks every day. He gets so excited when I ask him if he want to go for a walk or if he sees me reach for his leash. At night when it is time for bed, I ask him if he want to go "sleepy". He gleefully trots down the hall to my bedroom and jumps into bed where he spends the night with me. In the short time that Coal has been in my life, he has become my little buddy. I can't imagine being without him. I love him dearly! !